I’m a day late! But we had an awesome Christmas Day, very relaxed and laid back and the first ever year I didn’t have turkey or ham! (I did cook turkey for the kids though).. Although I didn’t intend to cook a 1940s Christmas Dinner it unintentionally became one….pretty much everything on my plate was fresh veggies! Not sure why it was such fun stabbing parsnips! Sorry- I’ve had such an incredibly busy week or two that I’ve not had time to devote to blogging properly but hoping to catch up over Christmas as I have nine wonderful days off.. These days, to reward myself, I try to think of non-food pick me ups and last night I decided to soak my feet in epsom salts, massage them with a peppermint moisturizer, and paint my nails a glorious christmas red and take time to enjoy the twinkling lights on the christmas tree while doing so..
I’ll have a couple more Christmas ration recipes to share this week with you so keep checking back! 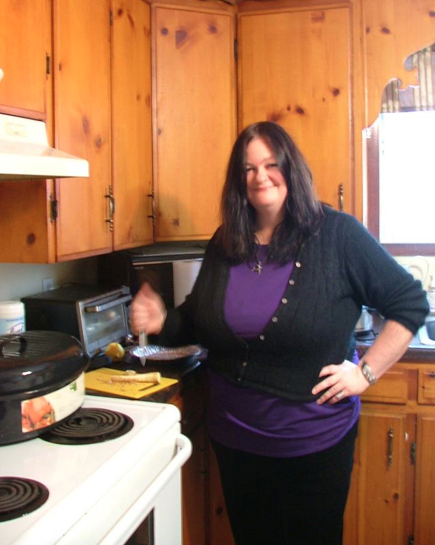 PS: I’ve just realized that I’ve lost 51 lbs but have only cooked 48 recipes! (I promised to cook a wartime recipe for every 1 lb I lost) I’ll have to make sure I add a bunch more ASAP! A 2 lbs weight-loss this week (265 lbs). 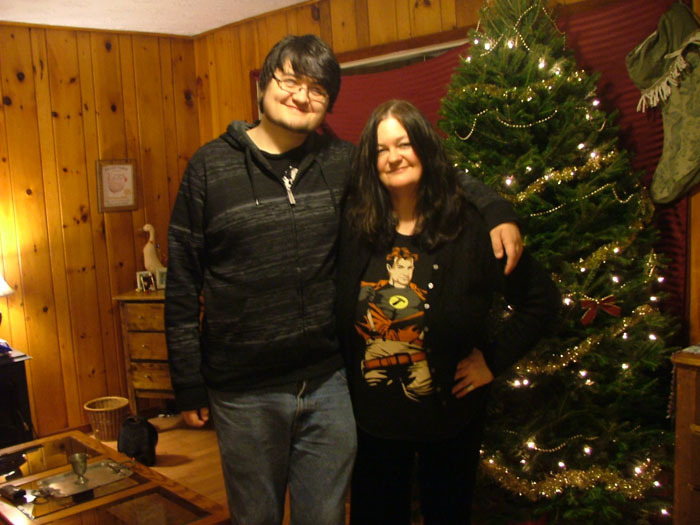 If my calculations are correct I am now 80 lbs down from my heaviest weight ever and 50 lbs down from when I initially started this blog…. This makes me happy, very, very happy! What also makes me very, very happy is that my son is visiting for the week, my eldest daughter Jess is happy, my youngest daughter Em played a fabulous Dirty Sheriff Harry (King Herod) in the school Christmas drama production last night AND our Christmas tree is up! It’s beginning to feel a lot like Christmas here in the Hobbit house! 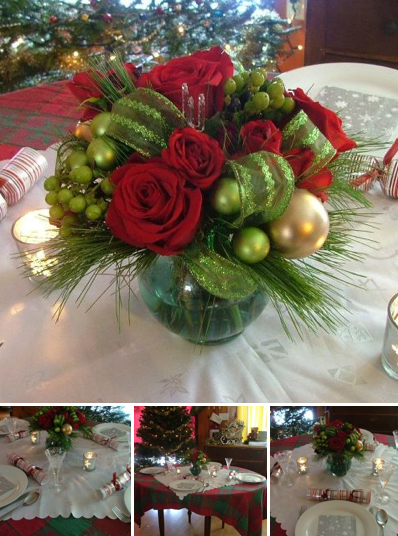 Countdown to a 1940s Christmas! Although I won’t subject my family to an authentic austere Christmas I will incorporate many 1940s Christmas recipes and goodies so please check back regularly for recipes such as eggless cakes, mock marzipan, mock icing, christmas pudding, christmas decorations and of course homemade christmas crackers! 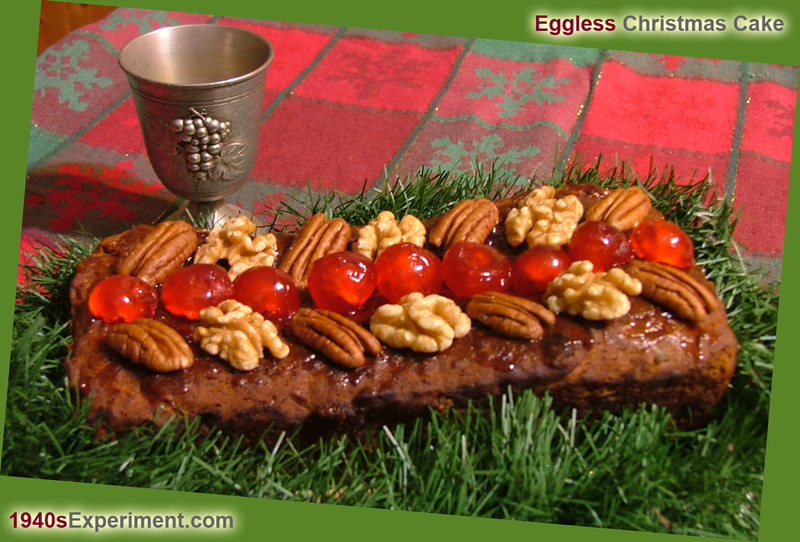 This Eggless Christmas Cake is a recipe from the British Home Front during World War II. Eggs were strictly rationed (1 egg per person per week) and many recipes were adapted without them. This makes a delicious small cake.. The British government banned icing sugar in 1942. Alternative toppings for Christmas cakes popped up and the housewife had to be inventive. In preparation for Christmas, hard to come by supplies were squirreled away and saved for use over Yuletide. Hey there.. my recipe has just been featured on “Come Dine with Me”..
Last week I cooked my very first authentic British WWII 1940s Eggless Christmas Cake for a new online magazine.. It was a trial run for me to see if it would taste good and try it out on my kids and see if they liked it too! Despite my misgivings about cooking grated carrots in Golden Syrup and a Christmas Cake that did not have eggs in – it came out marvellously and made me a meatloaf sized cake that tasted bloody wonderful! PS: I’m still working on the “Home Front Kitchen Radio Show” so I’ll let you know once that is going to air!